In the NOW, which started out as an RT show hosted by RT’s Senior Political correspondent Anissa Naouai, is now a fast-growing digital content platform available on all major social media networks. With three million followers on Facebook, it is now more popular than RT America with one million followers, RT France with 856,000 followers, RT Deutsch with 354,000 followers, and RT UK with 295,000 followers — combined. While In the NOW does not promote its connection to RT, no apparent attempts to actively hide it. In the NOW’s website registry is publicly available via Whois Record, an online tool designed to track information about websites. 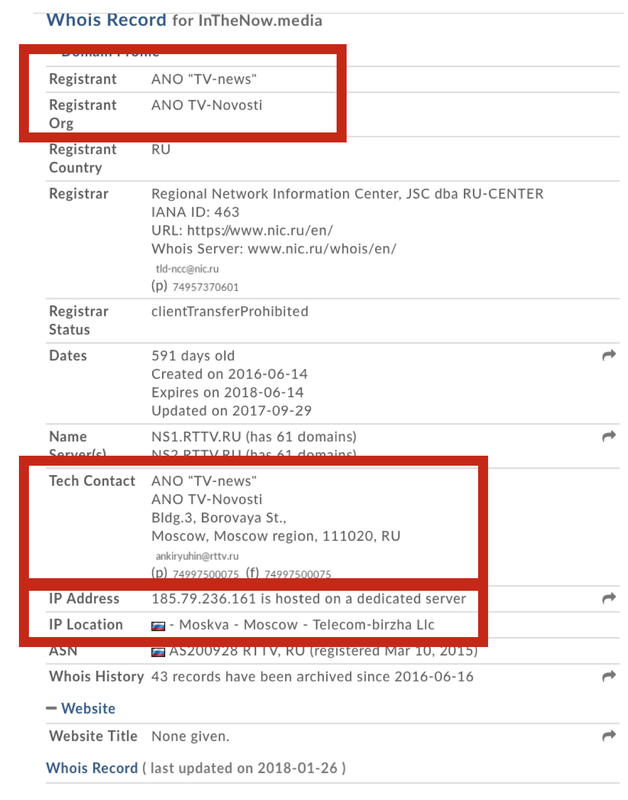 The site is registered by ANO “TV-news”, RT’s parent company and uses the same IP address as RT’s websites, including Assange.rt.com, 9May.rt.com, and others. In the NOW maintains pages on all mainstream social media accounts — Facebook, Twitter, Instagram, Youtube, and Snapchat — which makes it the only arm of Russia’s state-funded information machinery to penetrate a social network dominated by 18–24 year-olds. In the NOW’s social media pages have a significant following. It has three million followers on Facebook, 18,500 followers on Instagram, 55,400 followers on Twitter, and 45,400 subscribers on Youtube. If the geographical distribution of In the NOW’s Twitter followers is any indication, Americans comprise the largest share of its audience, with the United Kingdom a distant second. Whereas In the NOW’s ideological connection to RT and the Kremlin is not advertised, it is easy to spot. A telling example was a video released in December 2017, in which Naouai accused the international community of failing to give Moscow the credit for “destroying ISIS”, despite a plethora of evidence pointing to Russia’s limited role in this. On June 14, 2017, In the NOW’s Youtube page published a video in which Anissa Naouai accused NATO of getting involved in the Bosnian conflict to “surround Russia”. The claim was unfounded and geographically inaccurate, as Bosnia and Herzegovina remains at least 2,000 kilometers away from Russia’s borders. Naouai also took a strong stance against the U.S. decision to force RT to register as a foreign agent, consistent with the behavior of other pro-Kremlin outlets, all of which rallied around RT. However, aside from editorial content, most posts on In the NOW’s social media accounts are not political or ideological. They are dominated by viral content, such as animal and food videos. A survey of the most recent 50 posts on the outlet’s Facebook page published between January 18 and January 26 revealed only four explicitly ideological posts. The other 46 can be classified as entertainment, which included videos about the Tide Pod challenge, Afghan schoolgirls, catcalling, road safety, and a neck tie that can hold a drink. The four that are ideological, however, do reflect RT’s mission. Another good example of how ideological content blended on In the NOW was Naouai’s monologue, which argued the U.S. wants war with Iran and depicted the U.S. as a war-hungry stakeholder in the Middle East. An even more telling example was an excerpt of a George Soros interview circa 1998 titled, “The Interview George Soros Doesn’t Want You To See”. Although this type of anti-Soros reporting was mild compared to that of RT, it nevertheless shared the same negative sentiment towards Soros. In the NOW did not stay impartial during the U.S. presidential elections in 2016 and, like RT, maintained a strong anti-Clinton bias. In one of her monologues, Naouai accused Google of censoring anti-Hilary Clinton content, despite the fact that the claim was de-bunked by Snopes. In another, she spread the unproven claims that Hilary Clinton wanted to assassinate Julian Assange, the founder of WikiLeaks. In the NOW’s Twitter account also shared a video that accused Clinton of stealing the furniture from the U.S. Department of State. The claim was also previously de-bunked by Snopes. The fact that In the NOW spread three de-bunked or unproven claims shows that like RT, the outlet remains focused on spreading pre-chosen narratives tailored to a specific target audience. In sum, both RT and In the NOW share similar biases in their reporting, namely, anti-“Western”, anti-NATO, anti-U.S., anti-Soros, anti-Clinton, and pro-Kremlin. In the NOW’s reporting, however, is calibrated based on youngers demographic and platforms and thus serves as an introduction to Russia’s disinformation narratives. The platform’s existence points to Kremlin’s long-term strategy likely aimed at grooming English-speaking millennials to embrace Russia’s worldview through ideological content layered into engaging or viral content. Donara Barojan is a Digital Forensic Research Associate at the Atlantic Council’s Digital Forensic Research Lab (@DFRLab).